Welcome to what may very likely be your next taste obsession. Za'atar is the condiment king of Middle Eastern cuisine and there are very few savory dishes that could not be improved with a dash of this versatile mixture. Just like salt brings out the flavor of foods, so does za'atar. Variations of this herb and spice blend go back to medieval times and it's common in all the countries of the Middle East. 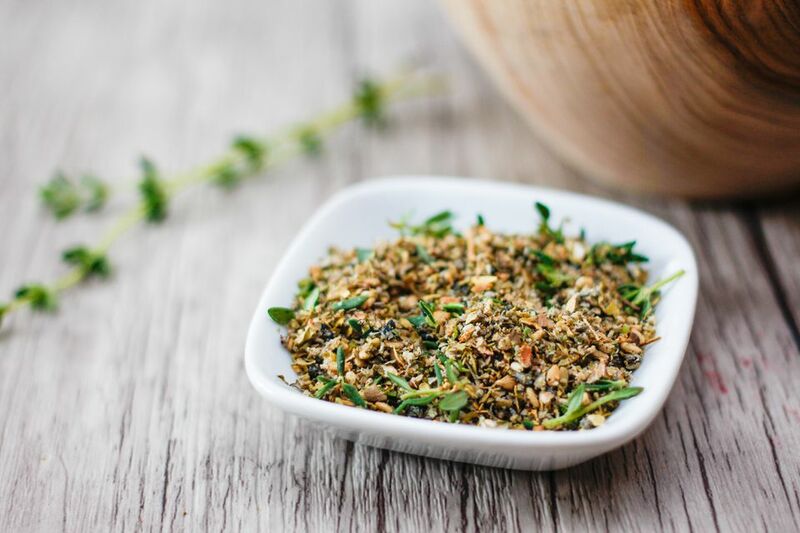 Typically, za'atar is a blend of dried thyme, oregano, marjoram, sumac, toasted sesame seeds, and salt, but as with any spice blend that is ancient, there are many variations and plenty of opinions about which is the right proportion for each ingredient. While there are many brick-and-mortar and online markets where you can purchase pre-made za'atar, you can easily make your own. The beauty of this is the ability to experiment with different proportions until you find your perfect "house" blend. It is amazing at how such a simple mixture packs such big flavors: The sumac brings a citrus taste, oregano a slight bitterness, and marjoram a hint of sweet. So start with the amounts here and don't be afraid to play around until it's just right. And once you have it down, sprinkle it on bread, dips, dressings, meat, vegetables, rice, potatoes, pasta, soups, and more. You'll be hard-pressed to meet a savory food that doesn't benefit from some za'atar love. Grind the sesame seeds in a food processor or with a mortar and pestle. Use in your favorite Middle Eastern dish and enjoy! Store the za'atar in a cool, dark place in a plastic zip bag or in an airtight container. When stored properly, za'atar can last from 3 to 6 months.